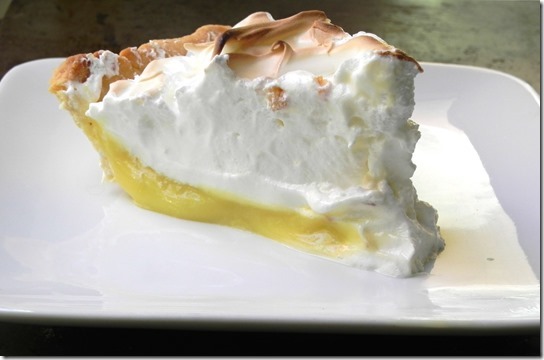 My dad’s all-time favorite pie was a lemon meringue pie. It’s funny how growing up I really never remember my dad requesting one. But if you ask my mom, she will happily confirm that it was indeed, his all-time favorite pie. Such an American pie to love for a Sicilian immigrant that grew up eating cannoli and other treats home-made by his mom and sisters. Treats usually made with their own homemade ricotta. In recent years it became a tradition at Thanksgiving for one of my best friends to make my dad “his pie”. He would start to ask me about it right after Halloween. He would remind me, “Tell Valerie I’m waiting for my pie. Tell her not to forget to make one this year.” I would feel a little embarrassed to tell her his message but she didn’t seem to mind one bit. She had a special bond with my dad and it was definitely created over her spoiling him every year with “his pie”. So there was never a need for me to bake his pie. These past weeks leading up to his birthday, I find myself baking a lemon meringue pie over and over again. Now that my dad has passed away, I find myself regretting never having baked one myself for him. Don’t get me wrong. I baked for him. I baked for him almost every day. It seems I lived these last few years for baking for my dad. I longed to see his eyes light up with each new bread and cake. I dreamed of fattening him up a little and having him feel better. I secretly wished my baking would keep him around a just a little longer. He would love this pie. I could just see his eyes brighten and hear him say with feigned incredulity, “You made this?” I know he knew just well that I made what I was sharing with him. But it would make me feel like a kid again for a moment. Making him feeling proud over something I accomplished made me feel good. Seeing my dad gush over my baking…I lived for those moments these last few years. Because my dad was the ultimate foodie. He loved good food and he loved great baking. Even though these last years were hell for him and he wasn’t supposed to eat what he did. He took risks and he lived as he wanted to live. As I approached my 3rd year blogging, I had doubts if I wanted to continue to post here. After my dad passed, those doubts increased. I wondered what was the point to keep sharing here. 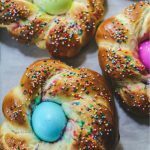 Without my dad as my biggest fan, what was this baking and blogging really for? But I knew I couldn’t give up my blog. I love the friendships I’ve made through this baking journey. I love trying new recipes and my kids would be pretty upset if I hung up my apron strings. It’s also been a while that I’ve debated back and forth over having my blog redesigned. Should I switch to WordPress from Blogger? I spoke with my dear friend Heather at Farmgirl Gourmet. She had some ideas for me. She understood what I was looking for and the decision was made to freshen things up here a bit. I hope you like what Heather created. I just love it! I’m thinking of my dad today and wish he was still here with us to enjoy his birthday with his favorite pie. Happy Birthday, daddy. This pie is for you! My cousin Alessio called me the other day from Sicily. He told me he went artichoke picking with his friend. He said he picked 100’s of them. So many different types. He gave them away to everyone he knows. He gave some to his neighbors, his mom, some friends. He sent me the photos because he said I wouldn’t believe how many there were at the farm. I was immediately taken back to Sicily when I saw these rows of artichokes. I have been reading letter after letters my nonna wrote my dad after he left Sicily for America. She often wrote about the artichokes that were growing splendidly on their farms. Last week was a very difficult week and time for all of us. My heart aches for those that suffered from the Boston bombings. I am keeping everyone in the Boston area affected by this horror in my thoughts and prayers. 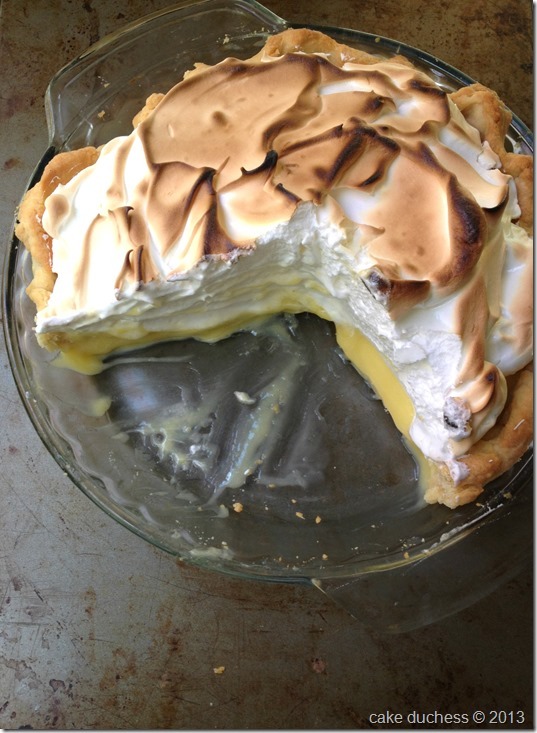 some notes on this pie: It’s hard to believe that I was never a big lemon meringue pie fan. I would taste a bite and would prefer usually any thing else that was available. This pie is wonderful and one I can’t pass up. I slightly adapted a recipe that I found in our paper from the Star Tribune. It was adapted from the Joy of Cooking. I used my favorite pie crust. You can use whatever pie crust recipe you love the most or use a ready made crust. This pie is best served the day it’s made. Keep the pie in the refrigerator after you cool it completely on the rack. To help get nice clean slices, dip your very sharp knife in hot water before slicing. Making this pie takes a little organization and patience. You can’t dump all the egg yolks into the filling or you’ll have one curdled mess. Also when you make the meringue, a little patience is necessary. Don’t rush and dump all the sugar in the mixer. It’s essential to slowly add the sugar bit by bit so it will dissolve all the way. A little planning and patience is all you need to bake the most incredible Lemon Meringue Pie. 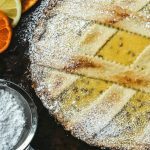 A flaky homemade pie crust filled with a luscious lemon filling and a fluffy meringue topping. Using your smallest pot , combine the cornstarch and water. Stirring briskly, bring to a boil until just translucent. Do not overcook. Scrape paste into a small bowl and cover. Set aside. Preheat oven to 400 degrees. Place dough in pie plate and crimp edges as desired. Prick dough several times with a fork. 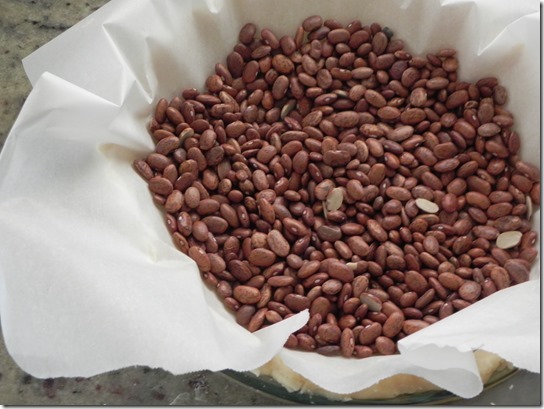 Place a piece of aluminum foil (or parchment paper)onto the dough and pour in about a cup of dried beans (this stops the crust from bulging while it bakes); bake for 7 minutes. Remove foil and beans and continue baking for 5-10 more minutes. Place crust on wire rack to cool. Reduce oven to 350 degrees. Grate the zest from two lemons to measure 2 to 3 teaspoons. Squeeze lemons to make ½ cup juice. Separate eggs, placing yolks in a small bowl. 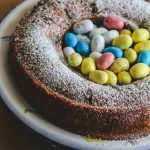 Place the egg whites in the bowl of a mixer. In a medium saucepan, whisk together sugar, cornstarch, salt and water. Stir constantly over medium heat. The mixture will become very thick; about 2 to 3 minutes. Remove from heat. Whisk lemon juice into the egg yolks. Carefully add a spoonful of the hot filling to the yolks, immediately whisking to combine. Repeat with 2 more spoonfuls. Then, whisking constantly, slowly pour the egg yolk mixture back into the filling. Return to medium heat and cook until very thick, stirring constantly. Remove from heat. Stir in butter and lemon zest. Set aside. Mix egg whites and cream of tartar on medium speed until very frothy, about a minute. Slowly begin adding the sugar, a spoonful at a time. It should take you about 2 minutes to add all the sugar. Increase speed and continue beating until whites hold stiff peaks. Pour filling into the pie shell. Spoon dollops of meringue around the edge, making sure there it goes right to the edge of the crust (no gaps). Pile the remaining meringue onto the filling. With the back of the spoon, create a few wisps. 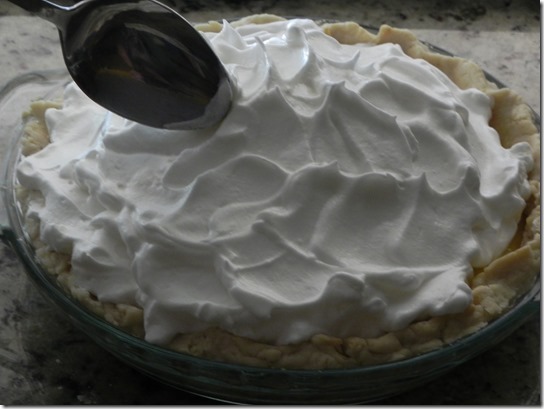 Bake pie for 15 to 20 minutes, or until meringue is light brown. Keep an eye on the pie. You don’t want it to get too brown. Let pie cool completely on wire rack. Refrigerate and when ready to slice, dip a sharp knife in hot water. Beautiful, lovely site makeover. I need one, soon! What a nice memory of your Dad. I bet he would have loved yours, because it looks amazing! 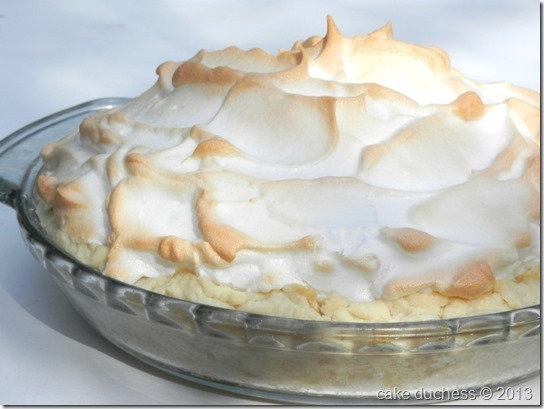 Lemon Meringue Pie is definitely on my list of things to make! This is such a beautiful post, Lora. So much love in that pie. I can almost taste it. It's so sweet that your friend made lemon meringue pie for your dad each year and I know your father would love this one you made. I've always loved it, too. This was such a sweet tribute to your dad. What a sweet post. I love the new design! Love your pretty new site!! 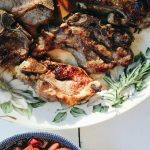 What a wonderful post about your dad and a great recipes to go with it. What a gorgeous pie! I pinned it already. I'm sure your Dad knows you made it for him. this post made me tear up! Your dad sounds like he was a wonderful and loving man. 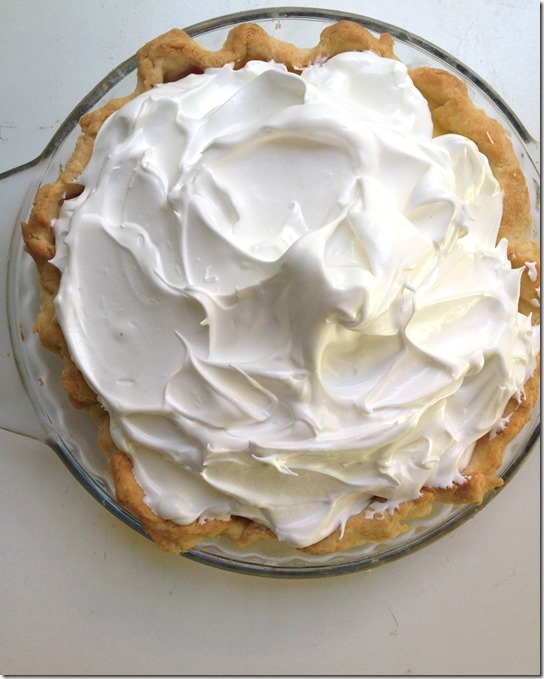 By the way – Lemon Meringue was my Mother's favorite pie too. I wonder if our parents are sharing a slice in Heaven with each other. 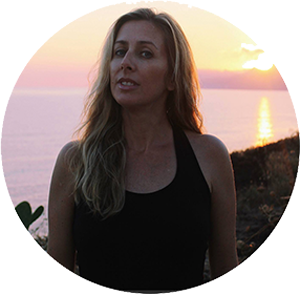 Thank you for allowing me to play with your blog design, it was a true pleasure to work with you. xo darlin!!! How special that you can carry on baking special memories of your dad and this lemon meringue pie is a lovely tribute. It's my dad's favorite too– the first pie I ever made for exactly that reason. Your site looks great, love the new look! Happy Birthday to your Dad..a very moving and lovely post xo. That said, WOW, I love your new site design! I was confused at first when I clicked on because I had no idea you were redesigning!. Heather did an amazing job! That said, YOU did an amazing job on this beautiful lemon meringue pie. Exactly how a lemon meringue pie should be..lots of meringue! Awe Lora, your dad would be so proud of you for this beautiful pie. You did an amazing job with it. I lost my dad almost 6 years ago to cancer, the anniversary of his passing is looming. I tend to get sentimental around that day and his birthday as well. And my mom's too. I lost one parent young and one when I was older, and I can say with absolute certainty that your age does not matter when losing a parent. It rips you apart at any age. We are always their little ones, and it is heartbreaking to lose them. So I'm sending a big hug your way, and lots of virtual comfort food. On the design front, I love it. It's so you, I think Heather really did a great job making it feel like it has Lora written all over it. Love how spacious the sidebar is too. Most are cramped. And the footer is fabulous. The header is gorgeous, I love the colours and the hearts. Great job ladies. The blog design is great! Thanks for sharing about your father, but glad you are continuing to blog here. Looking at other people's blogs are always inspiration. Such a wonderful post (and pie!). I'm sure your dad would have loved it. Lora, I'm so glad you continued blogging. I only recently discovered your blog and the first post I read was actually the one you wrote after your dad passed and you went to Sicily. That post made me tear up and so did this one. I can feel the immense love you have for your dad with every beautiful, heartfelt word you write. I also think it's incredibly sweet that lemon meringue pie was a special thing between your best friend and your dad. Don't feel bad for not baking this pie for him. This is a wonderful tribute to him as you approach his birthday and your pie looks amazing! Ooooooh I loooove the new design! It's as beautiful as this amazing pie… and the tribute to your dad. Holy artichokes!! Thats beautiful!!!! 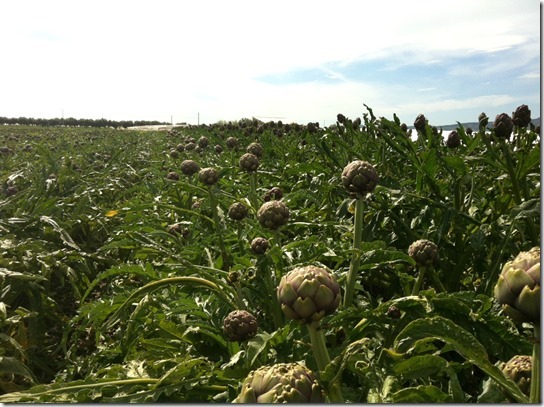 We want to go harvest artichokes in Italy too!!! I have a feeling that your Dad would be very proud of your decision to keep this site going (love the redesign). This was another lovely post and a delicious looking pie. 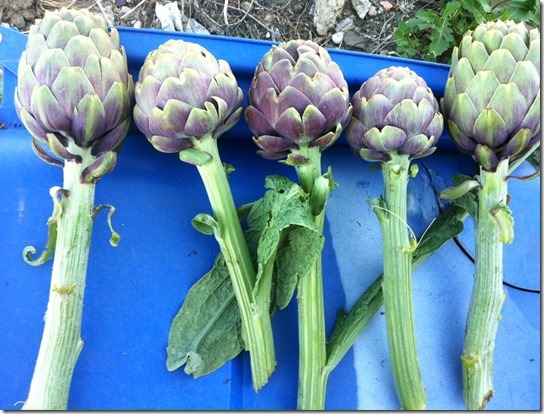 Beautiful birthday tribute to your father, wonderful photos and wow…those artichokes. 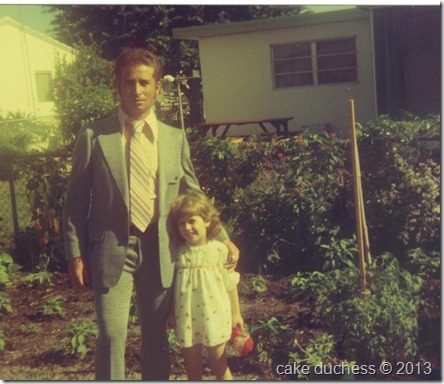 What a lovely way to remember your dad, Lora, and I love the blog makeover. It looks great and really highlights your beautiful baking. 🙂 BTW, we need some of those artichokes. Oh, my! What a beautiful post and thoughts about your Dad! I am sure he is smiling upon you each and everyday. This pie looks divine. BTW – Love the look of your new site – it looks great!!! Such a wonderfully honest post, Lora. I imagine that it was hard to continue to feel passionate about something when your father passed away… but he will always be with you, cheering you on, wanting you to continue baking up delicious things to feed your family. And, yes, I do love this pie… and the site. It will continue to be a place for me to come if I am ever in need of something to make me smile. 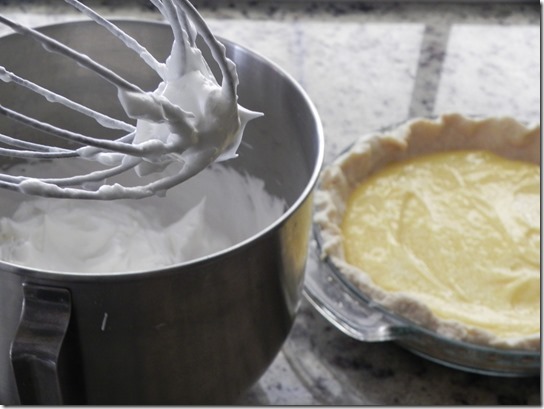 Lemon meringue pie has been a favorite of my father and brothers forever, mostly because his mother made it all the time. It´s still a favorite in this country, but I only made it a few times. It´s decadent Lora and creamy! It´s nice to remember our loved ones with food, it´s such a great connection. Though I can´t believe you thought about not blogging anymore. But when life hits us and everything changes, sometimes we want to change too. Your new look is so gorgeous! Lora, this is such a lovely post. Your dad would have been proud of this beautiful pie. I love the new look of your site! Your new site is Beautiful!! Congratulations on making the switch. Fresh starts are always healing. I have always loved Lemon Meringue Pie and have made lemon tarts of all kinds but never this clasic. Which I love. I'm glad you finally made one and now I will follow in your footsteps. I know exactly how you feel about your dad and wished I could have had the chance to bake more for my brother. Or with him. But I know your dad loved everything you ever baked for him. I love that photo of the two of you. And I love the blog redesign but, but I miss your golden sparkly crown! I used to love my Mum's lemon meringue pie growing up, yet it's never a dessert I'd ever order at a restaurant – I think because it never tasted as good as hers did! She doesn't make it any more, so I really should start to make it myself. Thanks for the recipe. I don't eating another lemon meringue pie! It looks so tempting! I LOVE the new site! I am also so glad you are going to continuing blogging after you Dad has passed, I am sure he would want you to! Great pie to remember your dad, even if you didn't get to make it for him! Hello sweet friend. Thank you for sharing these memories of your sweet dad. I know that these memories are bittersweet. This pie is heavenly, and I know he would love it. 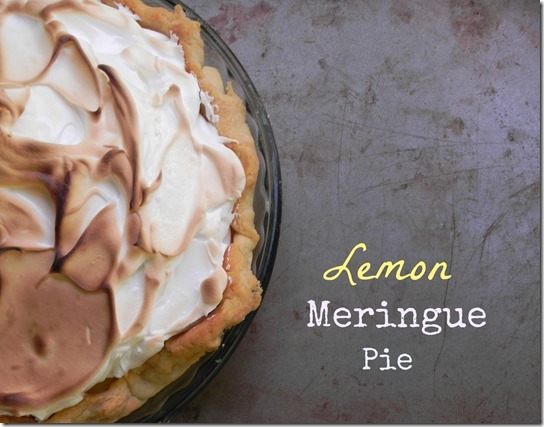 My mom's favorite pie is lemon meringue, and now I'm inspired to make this for mother's day. Thank you for sharing. My dad's eyes light up when I bake for him too! Just about any time my mom stops by he will ask her "did you bring me anything?" when she gets home. Lemon Meringue Pie though, is her favorite. But like you, I haven't really made it for her. You've inspired me for Mother's Day! A beautiful posts, Lora. I know your Dad would have loved the pie. Thank you for sharing your beautiful memories, Lora! You are so very talented! I LOVE your new blog look! Have a wonderful weekend!